Where is the SES when you need it? During my time in Flowerdale I have witnessed some pretty ferocious displays by Mother Nature including highly localised tornadoes sweeping up our valley. It was always of some comfort to know that in case we lost a roof or all our windows the SES was never too far away (well, in Kinglake anyway). Think of those without such a service. In the middle week of September there were a couple of days of heavy drumming rain. Most creatures took cover in holes and under logs. 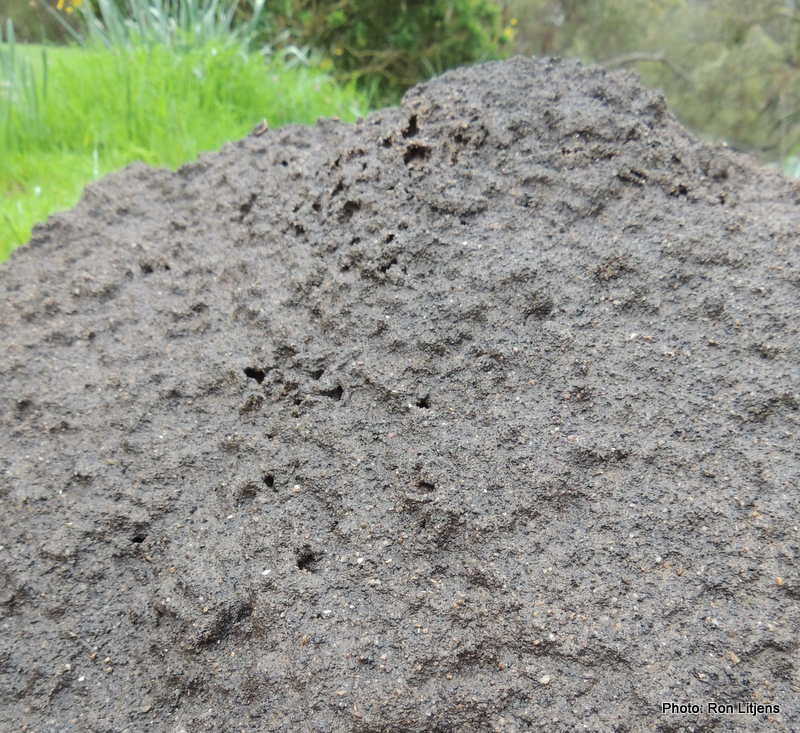 But the driving rains simply washed the top off our local termite mound. 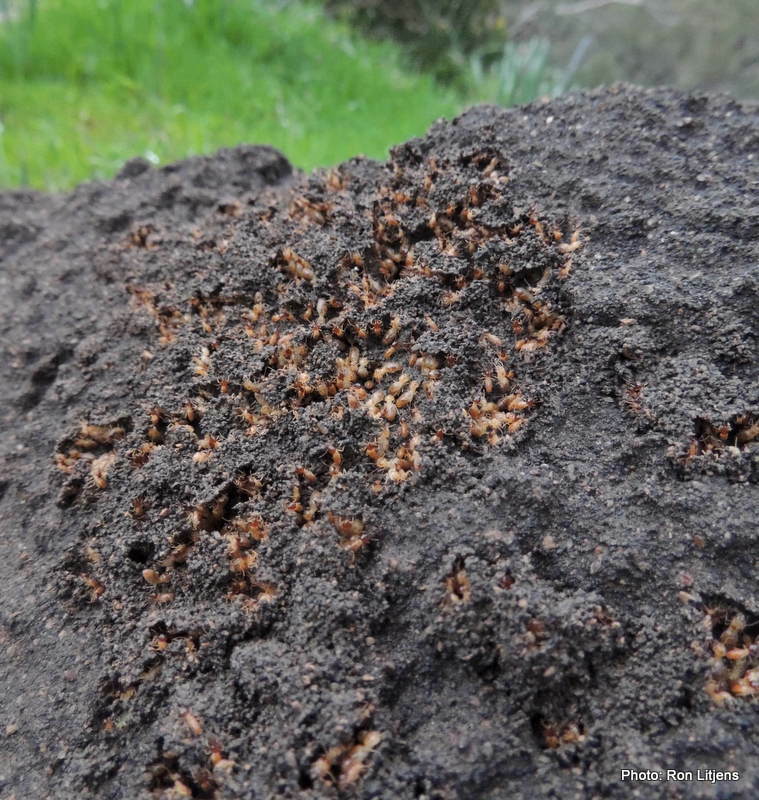 Termites, sometimes incorrectly referred to as ‘white ants’, are social insects that live in large communities (called mounds if they are above ground). The nests are built from a combination of soil, mud, chewed wood or cellulose, saliva and faeces. Termites are delicate insects that need to stay moist to survive. The temperature and humidity inside a mound, as well as the oxygen to carbon dioxide ratio, is controlled through a network of tunnels and galleries. Any breach of the outer walls disrupts these environmental conditions and prompts immediate action to repair the damage. In addition, exposure of the nest renders the termites susceptible to attacks from predators such as ants and birds. 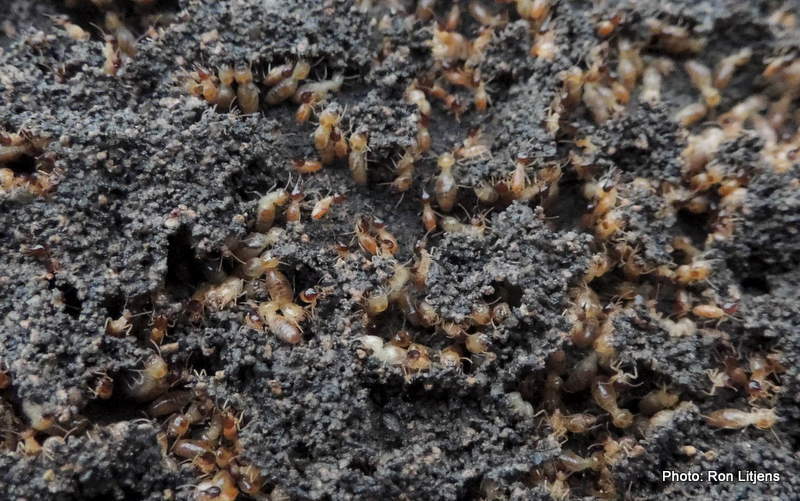 So it was that hundreds of termites (Nasutitermes sp.) were seen repairing the rain-damaged mound. In the picture above (click to enlarge) the workers have the pale heads and the soldiers have the dark-brown heads. By the next day the work was done, with not a tarpaulin or insurance assessor in sight.